This breathtaking Mansion boasts 4 Bedrooms! Private Parking! Courtyard! Amazing Location! Colonial Park Cemetery is a beautifully restored piece of Savannah's past and it remains the final place of rest for many of the city's earliest inhabitants. It was established in 1750 and began as the Christ Church Parish burial ground. In 1789, it was expanded to include people from any denomination. Among some of the people buried in the cemetery are one of the Declaration of Independence signers, as well as the first President of Georgia and many others. The cemetery is located on Abercorn and Oglethorpe and if you stay at one of Southern Belle's Savannah vacation homes, it will be right outside your door. The Oglethorpe Manor Main is one of our vacation rentals Savannah GA overlooking this cemetery on Oglethorpe Avenue. It has room for up to 10 guests and four bedrooms with four and a half bathrooms. Our Savannah vacation rentals always offer excellent amenities with well-designed interiors, wireless internet access, flatscreen TVs, full kitchens and more. Our Savannah vacation homes also occupy some of the best locations in the city, with walking access to many of the city's most popular attractions. Guests are often amazed at how luxurious and beautiful the interiors of our vacation rentals Savannah GA are and this one is no exception. The main living room has plush and comfortable seating, a huge flatscreen on the wall and tall windows to let in the Savannah sunshine. Just outside this room is the dining room where you'll find a table for six and easy kitchen access. The full kitchen has everything you need to prepare some great meals at home during your stay. It has a dishwasher, big double sinks, a full-size range and oven, plus a refrigerator and lots of prep area on the counters. The bedrooms in our Savannah vacation rentals are so comfortable that you may not want to leave! Lots of space to move around, a flatscreen for watching your favorite shows, comfortable beds and bathrooms immediately nearby. It's hard to beat the locations of our Savannah vacation homes and this property is definitely one of the more desirable ones. Not only do you have the aforementioned Colonial Park Cemetery right outside your door, but several of Savannah's historic squares are within easy walking distance as well. Wright Square, Oglethorpe Square, Columbia Square and Chippewa Square are all nearby. Even though you have the opportunity to make some home-cooked meals in our vacation rentals Savannah GA, there's also a number of places to eat in the vicinity when you're too tired to cook. Zunzi's, 17Hundred90 Inn and Restaurant, Bella Napoli Italian Bistro and the Collins Quarter are all nearby options. In terms of things to do near our Savannah vacation rentals, it's hard to beat this property's location. To the east, you can find the Webb Military Museum and the Oglethorpe Gallery. To the north, you will run across the Davenport House Museum and Owens-Thomas House. If you head a bit to the west, you'll find the Juliette Gordon Low Birthplace, plus the Savannah Theatre and the Bakerton Weathers House. If you go just to the south of the Colonial Park Cemetery, you'll find the towering Gothic structure of the Cathedral of St. John the Baptist. If you're planning to stay a little longer in our Savannah vacation homes, then you might consider driving out to Tybee Island to enjoy some time on the beach or on the water. This little barrier island to the east has both sandy Atlantic beaches and more rugged river beaches. You can watch the main maritime trade route to the north as ships come into the Savannah River Port. Also up north is the Tybee Island Lighthouse. Make sure to enjoy some local seafood at the Crab Shack or A-J's Dockside. Another fun place to visit, especially with kids, is the Tybee Island Marine Science Center. You can make a trip to Tybee almost as relaxing or as action-packed as you want. There are a number of places on the island to rent watercraft, as well as book charters. You can also get fishing equipment and fish from the docks. The Tybee Island Pier and Pavilion especially is a popular fishing spot. 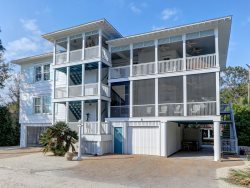 Make your Savannah vacation plans with Southern Belle's vacation rentals Savannah GA. You'll be amazed by our huge selections of both Savannah vacation rentals and rentals on Tybee Island. We have anything from expansive manors to cozy condos. Book your favorite on our site today. We really enjoyed our stay, the house was beautiful, thank you Southern Belle!